He’s also made a few more Miiverse posts talking about what he’s eaten and marking the end of the Revival Festival. I’ll post those later today or tomorrow. For now, if you want to see his previous Miiverse posts translated into English, I have most of them here! I adore his continuing use of “Potential!” as a motto/catchphrase. This is so awesome, Itoi seems like such a nice guy. There’s plenty of stuff coming to the 3DS. Watch the entire Nintendo Direct. lol. The Wii U needs some games and there’s nothing wrong with putting a long-desired game on a console to get more sales. It’s business. Hell, if it sells well enough we could see more of the franchise. Buying a Wii U and purchasing Earthbound will still be cheaper than seeking out an original copy. I agree 100% with Swine. I’m hoping that once EarthBound is released he’ll pop in the Miiverse community and drop little sayings here and there like he did for the Japanese community. Plus this is our chance to show our love and support this game and Nintendo and show just how much the Earthbound fanbase has really grown. And at the end of the day, that’s what this is really all about. And who knows, if it does well and wakes Nintendo up to this, they’ll release MOTHER 3 worldwide? That guy is just so kind. POTENTIAL! The fight is over. Our powerful PK Fanboiism Ω has overwhelmed the enemy. It was a 1X year struggle. We lost many cups of Lifenoodles in the process, but we have succeeded and the feeling of success is ever so dakota. This fight. Now for THE ULTIMATE BATTLE OF LIFE AND DREAMS! 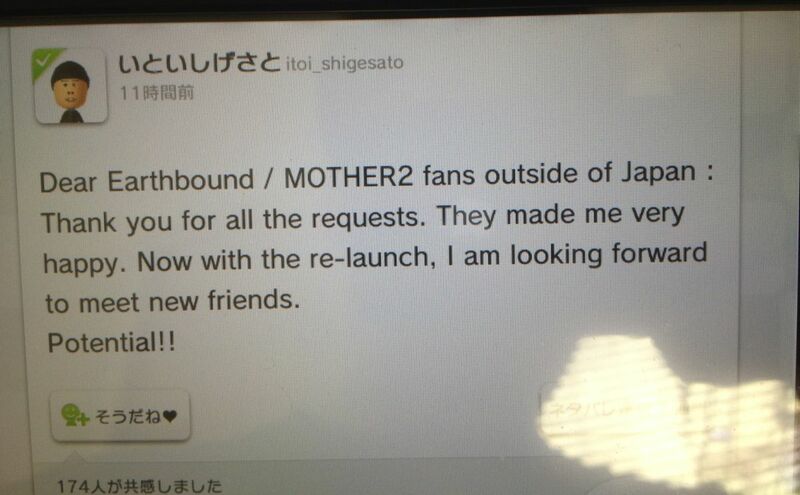 Or, instead of that, let’s just see about getting Mother 3 and NES Earthbound to be officially released. NES Earthbound is potentially really easy for Nintendo to do. The copyright issues are basically nonexistent compared to SNES Earthbound, and the game itself uses some simple mappers allowing for easy emulation, also Nintendo already fully translated the game. Yes, I would prefer if Nintendo re-translated the whole thing with modern standards (and they could up the ROM size to fit in as much text as needed), but this would be the cheaper and frankly more likely thing to happen. Mother 3 is the trickier one. They’d need to take the time to do a full translation. They’re unlikely to use a “hacked” ROM in favor of modifying the source code properly (which would also resolve certain slowdown issues in the naming screen, for example), so it would basically be a big project. They’d probably only be able to justify it if Earthbound (SNES and NES) took off in sales. On the bright side, I strongly suspect the game wouldn’t actually be emulated on the 3DS. The memories are fuzzy, but I believe the original DS used the GBA processor in addition to the DS’s main processor for games. As a result, the DS Lite had to keep the GBA processor (even though it lost the slot, and thus backwards compatibility) in order to be fully compatible with all DS games. This should extend to the 3DS, which I think is capable of natively playing GBA games so long as they are properly “hooked” into the processor through some code trickery. In support of this, GBA games act differently than ALL other “virtual console” games on the 3DS. They seem to be running “raw” off the hardware, with nothing special done like when playing any other sort of game through emulation on the system. However, this could just be an odd quirk, and I am not 100% certain by any means. Still, it would be interesting to think that if they did finally release Mother 3, it would STILL be running on the intended hardware, even if that hardware is locked in a 3DS. The 3DS actually does not have an ARM7 processor (as used on the GBA, and for GBA compatibility on all previous DS models); it runs only a dual-core ARM11. What this means for the system’s GBA compatibilty is unclear to me, though; you may be correct that it could run Mother 3 in native mode. I think it is pretty clear he had a big influence on this release. Thanks Itoi! POTENTIAL! reminds me of how he ended the Mother 4 interview. Actually, after that interview I wonder, would Itoi call this Mother 4?